University of Miami Head Baseball Coach Ron Fraser calls Joel Green one of the first really outstanding players. There have been many since, but Joel was the beginning of greatness. 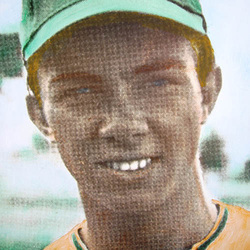 Joel gained honorable mention All-America acclaim as the Hurricane shortstop during the 1969-71 seasons. He was named to the District III all star team each of those three seasons as well. His summer team, the Boulder (Colorado) Collegians, won the summer league national championship after his sophomore season. The following summer, Joel played for the United States All-Star team which competed in Santa Domingo. The U.S. squad lost to Cuba in the championship game. Coach Fraser was an assistant coach for the team. Following his senior season at the University of Miami, Joel was a second-round draft choice- 14th pick overall- by the Chicago Cubs. During his five years of professional ball, Joel, who still is listed among the UM leaders in stolen bases, was a leader in that category with the American Association. He also recalls being named to the Texas League All Stars. Joel spent 2 and a half years with Cubs' AAA team in Wichita and was invited to two big-league spring training camps, but a bad back forced Joel to leave professional baseball. Ironically, two years after he had left baseball, Joel received a word that he had been traded to the Yankees, "I guess there was still some interest in me," Joel remembers, "but I hadn't picked up a baseball at all over those two years, I still haven't." Perhaps it was the back pain that made Joel leave one career and inspired him to pursue another. Although he had a dgree in Marketing from UM under his belt, Joel decided to stay in the Midwest where he attended Logan College in St. Louis and became a doctor of chiropractics. Joel, who tonight becomes the first baseball player to be inducted into the University of Miami Sports Hall of Fame, now is a chiropractor in Danvers, mass.